Alert to home and business owners requiring roofing services in the Southeast Texas area: look no further! Corpus Christi Roofing is the best choice for all your roofing system needs. With more than fifteen years of combined experience, we are a professional roofing contractor serving customers on both residential and commercial projects throughout the Corpus Christi area. ​We provide a full-service platform of services for our customers, specializing in metal roofing systems, gutters, and downspouts. We are licensed, bonded, and insured. Our team of localized professionals are always prepared to go above and beyond to serve every customer - as well as every roof – guaranteed! Our team of roofing specialists are professionally skilled at performing services on residential projects throughout the local area. We specialize in projects where we consult with the home owners, landlords, and residential property representatives on a regular, and consistent basis. Commercial structures are right up our alley, and involve a lot of specialized services we are vastly accustomed to. Whether you are a business owner, lease holder, or organizational representative, we are familiar with addressing the roofing needs on commercial properties. Roofing contractors are a dime a dozen these days. However, a quality roofing contractor in your city is one to remember, and one to familiarize yourself with if they have an advantage over their competition. To develop a better understanding of where we come from, take a glance at some of our professional qualifications. We at Corpus Christi can guarantee we are the best choice for your roofing project. Local. We aren’t only roofing contractors – we are proud Texans residing in the City of Corpus Christi. We love our beautiful coastal city, and intend to implement our quality materials and services upon every roof we encounter. If you live in or within the vicinity of Corpus Christi, our roofing specialists will be available to assist you on all the roofing needs required for your satisfaction. Emergency Relief. As local residents in the southeastern portion of Texas, we have become very familiar with the volatility of storms and natural disaster residing from the Gulf of Mexico. We were personally affected by Hurricane Harvey in 2017, and fully mobilized to help and assist as many property owners as we could. Whether your structure encounters weather damage of any range, our personnel are prepared to provide immediate emergency services as requested. Professional. Corpus Christi Roofing is a licensed, bonded, and insured business within the state of Texas. Liability is a common concern for roofing contractors; since we are familiar with the high insurance costs and costs involved, we work with property owners to provide a negotiable and fair price before we mobilize on any services required. Customer First. The satisfaction of our customers is ultimately the most important aspect of the services we provide. While our business is roofing, our focus is on customer satisfaction. We intend to provide whatever they may need when it comes to roofing. Our personnel are trained craftsman, skilled in providing a variety of services with our customer’s satisfaction in mind. Safety Guarantee. As professional roofing contractors, safety is always paramount to every project we are involved with. Our performance and safety procedures are subject to OSHA standards and are always followed on the project site. Our customer’s satisfaction and safety is always in consideration, and we ensure that our personnel is able to maneuver around the site with smooth, yet safe methodologies in mind. Whether you represent a residential or commercial property, our roofing professionals are at the ready to provide quality service at the drop of a hat. We are an A+ BBB Accredited Business within the State of Texas, and intend to continue to provide premier and lasting services for all the residential and commercial customers we serve. Scheduling a roof inspection should not be made into a hassle or challenge – if your property requires attention, fill out the straight-forward form above and we will have one of our customer service representatives reach out to you within 24 hours. Even if you believe your roof may need just a slight repair, we will deploy a roofing professional to give your property a fully comprehensive roofing examination and action plan if services are required. Corpus Christi Roofing is a full-service roofing contractor that provides a variety of services to various project types throughout the City of Corpus Christi. Our list of services are below to help you establish an understanding of what we can bring to your roofing project. A vast majority of our personnel are homeowners, and know the responsibility involved with personal, residential roof maintenance. 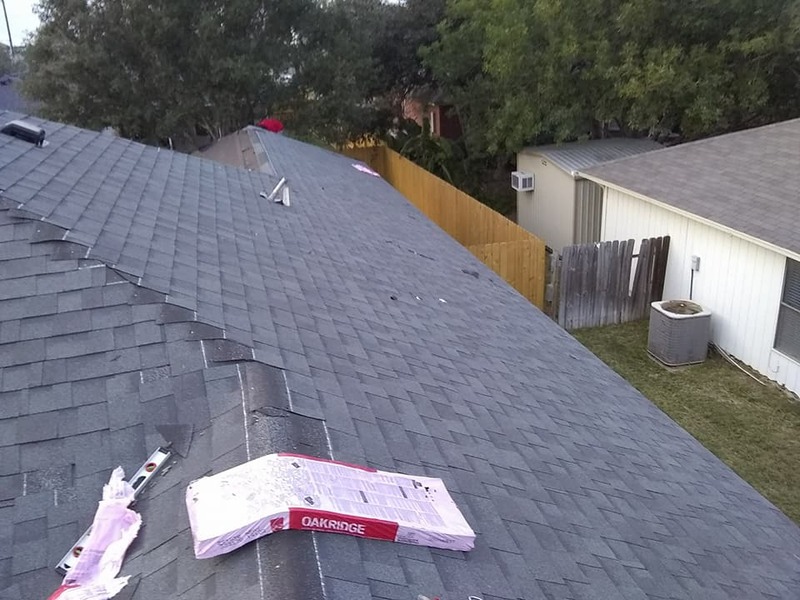 As specialized residential roofers, Corpus Christi Roofing provide only quality roofing materials, including Owens Corning shingles. Whether your home has a roof plagued with loose or worn out shingles, we can remediate that issue for you with a professional and certified touch. We at Corpus Christi Roofing understand the many hats that business owners wear, worrying about your roofing needs is the last thing you want on your plate. Let Corpus Christi Roofing alleviate all the concerns involved with your local commercial property today! Whether your property’s roofing system involves a flat roof with TPO or modified bitumen on a low-slope system, we are the roofer for you. Corpus Christi Roofing specializes in repairing and installing metal roofing systems for residential and commercial customers alike. A traditional roofing option, metal roofs are conventional options for commercial properties, but tend to be a tad more expensive than other systems on the market. However, metal roofs are the most durable and have the longest life-cycle, and are well worth the up-front cost involved. As professionals in the metal roofing business, call Corpus Christi Roofing for an inspection right away! As premier roofing contractors, we guarantee our services to meet the requirements and satisfactions of all our customers. In part to our quality materials and our expert personnel, all our roofing projects are guaranteed to be windstorm certified, or your money back. We are a CertainTeed© preferred contractor that is delivered to our valued customers with a manufacturer’s warranty in place to ensure your satisfaction for the services we deliver. As roofers in Corpus Christi, Texas, we know we live in a beautiful place. We may be biased since we are from around here, but we know that our community is treasured, and we are passionate about instilling and continuing that legacy in our trade as roofers. We are proud of every project we serve, and are thankful for the customers that keep us busy in the local area. If you live in or around the city of Corpus Christi and require roofing services on your residential or commercial roof, call Corpus Christi Roofing today for our expert and professional roofing services! CALL CORPUS CHRISTI ROOFING TODAY.